What Every Writer should know about launching their first book! A good book launch party should be about the guests as much as it should be about your personal achievement. Your guests are there in support of you, so make sure you greet them with food, drink, entertainment, free swag, and the chance to win prizes. 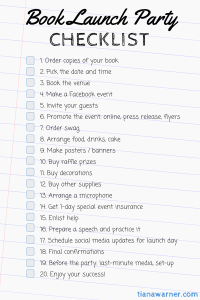 The preparations are a lot of work, but this step-by-step checklist should help reduce that feeling of floundering aimlessly as your launch day approaches. Start planning 3-4 months in advance, and don’t be afraid to accept help from those who offer. Click the image to see the graphic, or click here to download the high-quality PDF. Read on to see my thoughts and recommendations for each list item.